In a prominent intersection on the outskirts of Singapore City in Paya Lebar lies Trinity Christian Centre, Trinity@Paya Lebar. Designed to imitate the vast canyons of the Israeli deserts, the building’s beige-colored facade mimics the folds of the desert landscape. The original lighting scheme did not live up to Trinity Christian Centre’s aspirations to become a neighbourhood night-time landmark. In fact, even the next door gas station outshone it and made more of an impact on the surroundings with lights. In consequence, ONG&ONG (Lighting Design) were commissioned to design and implement a new lighting concept for this house of worship. Inspired by the original visions behind architecture ONG&ONG (Lighting Design) set out to use the light to mimic the hues of colors of the Israeli skies and to tell meaningful stories to the community. 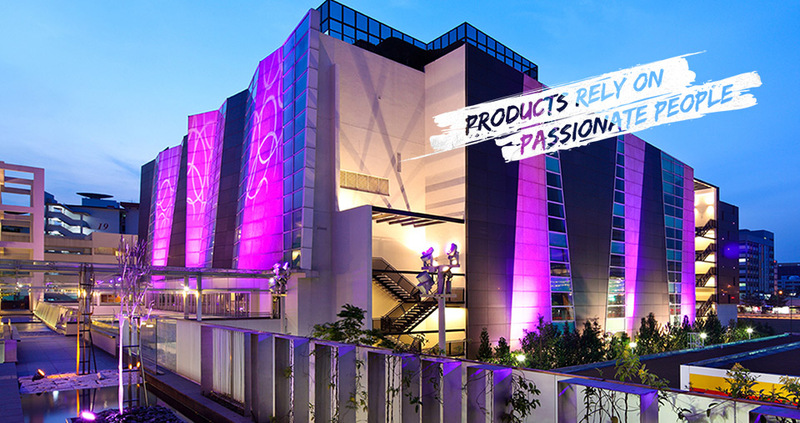 After a series of shootouts to test various fixtures from different manufacturers in relation to their wash quality and color rendition, Martin fixtures from the Exterior range were chosen to project the new design onto the facade of the building. The fixtures were mounted on poles, equipped with lenses and glare shields to reach all the folds in the facade and complement the geometry of the architectural surface. The new lighting design attempts to create a connection between the church and its community. Pre-programmed sequences display messages of faith and joy to spectators, and colors and projected patterns add a dimensionality to the architecture. The animation and vibrancy of the colors mirror the dynamism of the sky. Against the backdrop of the relatively quiet, semi-industrial surroundings, Trinity has now completed its transformation into a new night-time icon in the neighbourhood. Exterior 400 Image Projector, 14 pcs. Exterior 410 with snoot kits, 28 pcs.